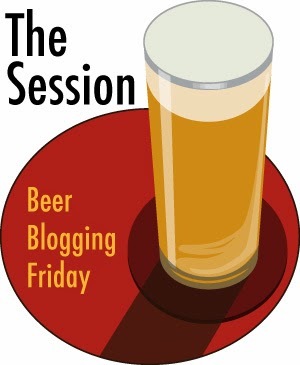 Firstly, the session, or beer blogging Friday is an event that takes place on the first Friday of every month. Beer writers around the world write an article on a single subject, picked by the host (that's me this month). The host then reads all the articles and writes a summary or round up article. It's a great way to write about something you might not ordinarily write about as well as get new people to read your blog. Most of all, it's just plain fun. You can find out more about The Session and how to participate here. Mill Park Brewery - Enniscorthy, County Wexford. Ever heard of this one? I'd be surprised if you had. The Mill Park Brewery operated from 1810 and was originally established by the Pounder family. The site was originally a former abbey, founded in 1460. Almost nothing remained of the abbey by the time the brewery was constructed except an original door and supposedly the friary bell with the rest of the masonry used to build St Aidan's Cathedral, which from what I can tell was completed in 1809. During the 1798 rebellion, the site was used by the City of Cork Militia as a barracks. In 1864, fifty four years after first opening, Messrs’ Stephen and Edward J. Lett purchased the brewery and began to make improvements reported at £8,000. In today’s money, from what I can garner from this website, that equates to anywhere between £645,000 and £778,000 sterling today. That's using retail price index or GDP deflater respectively as calculation methods. I'll not pretend to know what any of that means. I couldn't find out if this figure was just for improvements or if it included the sale price but from the wording, I suspect just the expansion. The brewery building was almost entirely rebuilt to allow for new brewing equipment. The new building is 107 x 43 feet, and is three stories high at one end and two at the other, with a deep cellar. During the time of Mr John Pounder, the flour mills were destroyed by fire, and rebuilt by him. The building is 79 x 23 feet and five stories high. Power was supplied by water, which came from a source in nearby Monart. I can't be sure where they are referring to here, there is the Monart Spa so perhaps there was a water source that fed the brewery back then. There's no sign of it now I'm afraid. The water wheel is described as an iron breast wheel, 32 feet in diameter and 8 feet broad and was erected in 1849. In ordinary seasons four pairs of stones could be driven in addition to the general machinery. Most prominent among the remaining buildings is the malt house which was built in 1867. It covers 236 by 45 feet and is five stories high with a large cellar. The newest building was a two-story mineral water factory measuring 120 x 19 feet. I'm not sure it can be seen from the road unfortunately but adjoining it are the offices it would seem, or at least they were when constructed. The mineral water factory was added in 1883. It was served by a three horse-power vertical engine, and bears evidence of careful management. The output, including champagne cider, fruit syrups and cordials, went to nearly every town and village in the counties of Wexford, Kilkenny, Carlow, Waterford, and Wicklow. The water was secured from a well on the premises at a depth of 120 feet. Mr Stephen Lett died in 1865, and Mr Edward J. Lett ten years later. The business was managed by the executors until 1881, when Messrs. George H. and Edward J. Lett, sons of Mr Stephen Lett took possession. They were described as young and energetic, with an aptitude for business and an ability to expand. They must have done pretty well because the brewery lasted another 75 years and only ceased production in 1956. Today, G.H. Lett and Co. Ltd exists as a drinks distributor, although according to the CRO, they are currently in examinership. It's is run by Jean and Phoebe Lett and is or was still run by the family. I vaguely recall mention of 4 beers produced by Lett's before they closed. Today, their Enniscorthy ruby ale sort of lives on in two countries. In 1981, George Killian Lett, the great grandson of George Henry Lett, sold the rights to Coors and Killian's Irish Red was born. Enniscorthy ruby ale had been brewed between 1864 to 1956. As I understand it, George Killian Lett was already allowing his beer to be brewed by Pelforth in France where it was called George Killian's Biere Rousse and still exists today. Peter Coors fell in love with the beer and convinced George to allow him to brew it in Colorado. An Irish red ale it no longer is though, today it's an amber lager that isn't worth mentioning other than its historical roots. I understand that the original Coors version, released in 1982, was in fact a top fermented ale, though was probably cold conditioned (lagered). George Killian Lett died at the age of 84 in Enniscorthy on Monday, December 6th, 2010. Just a note that while I live in Dublin, I picked Lett's because my dad lives across the road from the old brewery. When I stay at his place and open the curtains in the morning, I'm greeted with the majestic image of the old malt house pictured above. I should also note that information on the brewery is sporadic at best on the internet but I did find a few sources from old documents that had been digitally scanned. Unfortunately a request to Lett's yielded no response, probably because of their financial troubles. Hopefully, I haven't made too many mistakes. One last thing, a lot of my information came from the Wexford county guide, written by George Henry Bassett in 1885. It's absolutely packed full of interesting information about Wexford during that time. And finally, thank you to everyone who joined in with The Session 87. I look forward to reading your articles and posting a round-up in a week or so. Weirdly, Lett's still has a current beer manufacturer's licence. Sad to hear the company is in examinership. Perhaps, to complete the circle, Molson Coors might like to pick it up (pocket change to them) and revitalise the Lett's brands. Killian's Red, shite and all that it is, does have considerable international recognition. It's always sad to see a brewery with a distinguished history come to an end. It's still operating as a distributor (Albeit considerably downsized)with the next generation of Lett's -Killian, Evan and Julie now heavily involved in the business. Hi Bruce! Do you know why it still has a licence to brew? I was amazed to find in your article about the brewery's connection with Pelforth in France. Pelforth beers have always been one of my most favourite beers since first sampling some `Brune’ & `Blonde’ in France over 15 years ago and to now find out it’s originates from Enniscorthy is for some reason quite pleasing. Maybe my GGF enjoyed a pint or two as well!